On May 24, 2016, Elizabeth Public Schools held its ninth annual Healthy Leap into Summer health expo in collaboration with organizers Gateway Regional Chamber of Commerce President, James R. Coyle and Trinitas Regional Medical Center Chief Clinical Officer and Vice President of Clinical Operations and Physician Services, Nancy DiLiegro, PhD, FACHE. The health expo, which is the largest teen obesity awareness program in the United States, according to the U.S. Department of Health and Human Services, took place in the Dunn Sports Center. The one-day program is designed to promote healthy lifestyles to high school students while addressing the epidemic of teen obesity. Childhood obesity has more than doubled in children and quadrupled in adolescents in the past 30 years. The annual Healthy Leap event provides Elizabeth Public Schools’ high school students the tools they need to combat teen obesity and live more health conscious lives. Over 2,000 students from the district’s six high schools participated in workshops, received health screenings, viewed food demonstrations, and had the opportunity to learn from interactive exhibits provided by organizations from Elizabeth and the surrounding community. Among the many popular exhibits were Bodies Against Bullying and the U.S. Army rock climbing wall. The expo concluded with a rally including performances and contests for students. 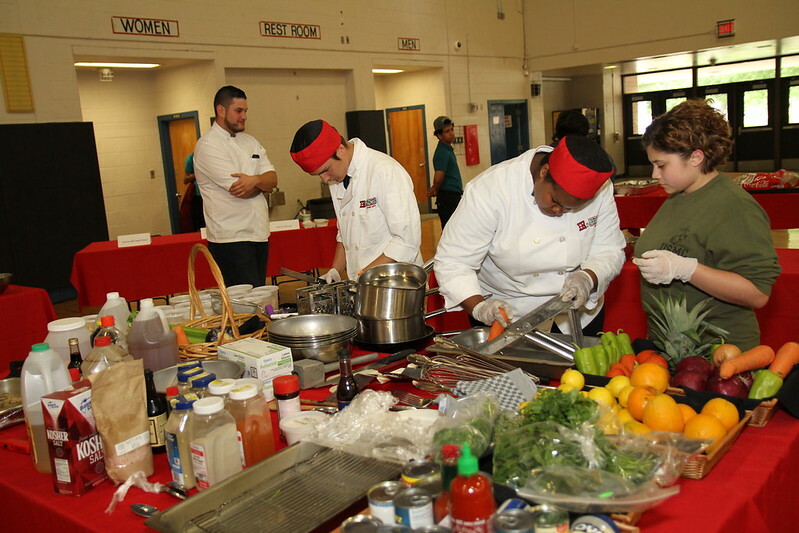 For the first time in the history of the Healthy Leap health expo, an iron chef competition was held in which three teams of two students and a culinary arts student from Thomas A. Edison Career and Technical Academy each had to create a warm or cold salad using a secret ingredient, which was duck breast. Three local chefs, Chef Daniel Ritacco of Newark Liberty International Airport Marriott, Chef C.J. Reycraft of Amuse in Westfield, and Chef Luis Ramirez of Sweet Waters Steak House of Westfield, served on a judging panel that determined the competition’s winner. Competition winners of the healthy poster, dance and iron chef contests each received $500 scholarships. Students also earned tickets from various exhibits and workshops which they entered to win FitBit Zips provided by the Gateway Regional Chamber of Commerce.